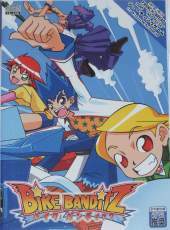 This is an action doujin game features five different stages of side-scrolling shmup action, which can be played either alone or simultaneously with a friend. There are four characters to choose from (one must be unlocked first), all of which have the option of fixed or homing missiles and either manual or auto bombing. Bombs are only available when the charge bar under your score is full; once you use a bomb this bar is completely drained and you have to wait for it to refill before you can use another. The main distinction between Bike Banditz and most other shmups is the pivoting "bit" that always accompanies your character. This item is locked in place when you are firing, but when the shot button is released it will move to cover the opposite side of your bike (so moving up will rotate the bit directly down). The game frequently has enemies coming in from unexpected directions, making mastery of this multidirectional shot vital. Pickups in the game are in the form of score enhancing gems and fruit (there are no power ups, all weaponry has fixed damage output) – these are released when enemies are defeated and as you collect more gems their value and size are increased, however getting hit will reduce the gem rank by two levels. Fruit are always worth a fixed amount of points. There are three difficultly levels to choose from, and if you need it a practise mode that allows you to try any previously reached level – there are no lives in this mode but it does keep track of how many times you die. A patch was later released that auto-unlocks the previously hidden fourth character and also adds a completely new fifth to the select screen, as well as a countdown timer for boss battles and numerous other minor tweaks. The colorful cartoony graphics make this a must play.